HBO returned to the Forum in Inglewood, California to broadcast their third foray into the Super Flyweight Division, dubbed Super Fly 3. 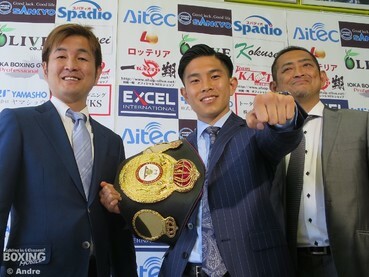 The Super Flyweight Division is currently one of boxing most intriguing, and it has drawn former World Minimumweight, Light Flyweight, and Flyweight world champion Kazuto Ioka (22-1) out of retirement and into a bout with McWilliams Arroyo (17-3). Ioka was “retired” for seventeen months, and was giving up size to Arroyo. Ioka went to the body early on but Arroyo was able to land a few good combinations upstairs. Ioka looked more relaxed in the second round and had Arroyo backing up most of the round, but Arroyo was able to stunt some of Ioka’s momentum in the third with crisp head snapping uppercuts mixed in with a faster consistent pace, but Ioka re-established control at the very end of the round with a hard knockdown from a right hand. Ioka looked confident going into the fourth round and was taking good angles and landing to the head and body of Arroyo. Ioka took a lot of uppercuts in the fifth round, but continued to come forward landing body shots and did not appear to be too phased by the. Arroyo did end the round with combination ending with a clean left hook. 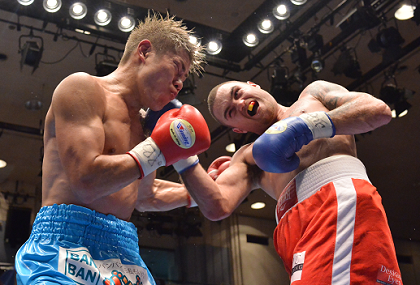 Ioka initiated the action in the sixth round and engaged in some fierce exchanges in the seventh round with Arroyo. Arroyo showboated as the round came to an end. 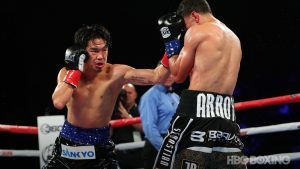 Arroyo came forward in the eighth round but Ioka was throwing the higher number of punches. The ninth round was punctuated by a left hook from Ioka and he entered the last round with a comfortable lead. Arroyo needed a knockout to win the bout in the final round, but he was unable to pull it off. The judges scored it 99-90, 97-92, and 97-92 for Kazuto Ioka. The co-main event of the evening was between Donnie Nietes (41-1-4) and Aston Palicte (24-2), two Filipino fighters in the Super Flyweight division. Nietes was the more polished and experienced fighter of the two, but Palicte was younger and much bigger. Palicte was throwing jabs to the body and head in the opening round while Nietes appeared to focus mainly on the body. Palicte showed that he was the harder puncher in the second round but was getting out landed by Nietes. Nietes accuracy was better than Palicte in the third and fourth round, but the rounds were close. 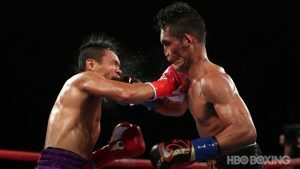 Palicte likely stole the fifth round as Nietes looked like he took the round off, but Nietes picked up the action again in the sixth and seventh rounds to retake control of the momentum of the fight. Both landed heavy blows in the eight round and showcased solid chins. Nietes looked like he was going for a knockout in the tenth round and had Palicte looking like he was discouraged. The technical superiority of Nietes remained apparent in the final two rounds of the fight, despite his age and size disadvantage. He had Palicte badly hurt in the final round and appeared close to knocking him down, but Palicte was able to survive. The final scores were 116-112 Palicte, 118-110 Nietes, and 114-114 for a split draw. The main event of the evening was between Juan Francisco Estrada (36-3) and Felipe Orucuta (36-4) in the Super Flyweight Division. Estrada was considered by many to be a heavy favorite going into this fight, and he looked to be in incredible shape. Orucuta looked to be a langy fighter and was getting tagged by the lead left hooks early on. Orucuta height however made him an awkward target, but he was getting outworked early on. Estrada focused his jab to the body of Orucuta in the third and fourth rounds and didn’t look too concerned about the power shots of Orucuta. Orucuta looked like he was beginning to tire, but was still able to land some decent shots. Orucuta touched the ground with his gloves in the fifth round but it was ruled a slip. Orucuta briefly had Estrada in trouble by the ropes in the sixth round. Orucuta was making it a fight though and got into several fierce exchanges with Estrada in an action packed seventh round. Orucuta however was hurt in the eighth round with a hard right hand that had the fans on their feet. 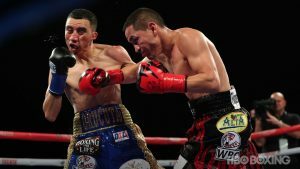 Orucuta and Estrada continued to go back and forth into the ninth and tenth rounds, and Estrada didn’t appear to look like he wanted to go for the stoppage. Orucuta ability to take a good punch was tested in the final two rounds, and he passed it with flying colors. Estrada was comfortably ahead in the final round, but he still had a bloody nose from the efforts of Orucuta. Estrada, despite likely being ahead, stepped on the gas pedal in the final round in an effort to get the stoppage and had tagged Orucuta several times. The final scores were 118-110, 117-111, and 117-111 for Estrada.